Grafted Heirloom tomatoes were trellised with the double leader technique. Each tomato plant’s leaders were pruned except for two which were clipped to its own individual string hanging from the top of the hoop house. This provided adequate airflow for the plants and made it easy to harvest in an efficient manner. We mulched the beds and aisles with hay for weed suppression and to prevent soil from contacting the plants. The outside rows were non grafted indeterminate red slicing tomatoes. We trellised and pruned them using the same method for the grafted tomatoes. Soil moisture sensors were placed in two of the rows to inform us when and how much to water. On average we watered once a week for about an hour. This changed according to the weather. On hot weeks we watered twice a week and during rainy periods we did not water at all. A humidity chamber was built for the newly grafted tomatoes. This consisted of a tent of plastic under the greenhouse table. Cardboard was placed on top of the table to block light out. This created the right environment for the grafts to heal. I learned this method from the first farm I worked at: Blooming Glen Farm. How to Graft: Grow seedlings of heirloom and rootstock so their stems are about the thickness of a pencil. Cut the top of the root stock off. 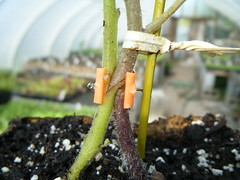 Cut a downward slit on the rootstock with a matching upward slit on the plant you want to graft. Insert the cuts together and plant into a single pot. Hold plants together with graft clips and mist the cut with a spray bottle. Place under the humidity chamber for 3 to 5 days. Pull the plants out and cut halfway through the base of the heirloom. Twist tie the plants to a skewer for support. Water the base of the plant gently to avoid soil splash. Place the plants back into the humidity chamber for another 3 to 5 days. Take the plants back out and cut all the way through. Now the root stock will be attached to the heirloom. There are some variables to this procedure. Observation of the plant’s health is vital. Slowly introduce the plant back to full sunlight before planting. The goal of producing the Crop Plan for NSF is to create documents that will aid in planting vegetables for three farmers markets. The plan will be based on the 2010 plan which gave us a good record of what and when vegetables were grown. This information also aids in our crop rotation plan. In 2011 new fields were opened up from fallow ground and new employees were added to the farm crew. Creating simple maps that include important information of the plan is vital for accurate record keeping. Calculating the amount of beds to be planted and where and when they would be planted is where I started. Producing the crop plan will provide me an intimate relationship with crop varieties and quantities needed to run a successful small farm operation. In years past I have been involved with greenhouse production, crop care, planting, and marketing. My desire to create the crop plan has come from the dream to one day own a farm (or mange one) in the future. Deciding how much to plant, where to plant, and when to plant can be produced on paper; however the variability of the season always plays a factor. I have read many books on the subject (Eliot Coleman and John Jeavons being a huge influence) but actually implementing the plan in reality is the experiential learning I am searching for. This past season we experimented with winter production and extending the season. The results of that special project can be found on this website under “Special Projects”. This taught me that with perseverance and dedication good results will show however there are always realistic barriers in the way. Grafted tomatoes in a hoop house will be another minor focus. Last year I experimented with this process with moderate success. This year I was determined to prove this method was valid and had the opportunity to grow in the farmhouse gothic hoop house, which had prime conditions for sunlight, size, and the ability to trellis the plants to 14 feet tall. The goal is to track worker hours and yield which will give us hard numbers to base its feasibility. I love the local food industry, organic farming, and how they are all connected. Last winter I decided to take a part time job at a restaurant in New Hope, PA called Sprig and Vine. I worked as a dishwasher to understand the back of the house operations. During my work there I was able to form a relationship with the chef. It was not glamorous work but we had lively conversations about unique vegetables and local farming. Through talking with the chef and pouring over seed catalogs while working on the crop plan I had a eureka moment; growing vegetables for one local restaurant on a half acre. I discussed with MR and he provided guidance and support to “rent” a half acre from North Slope Farm. 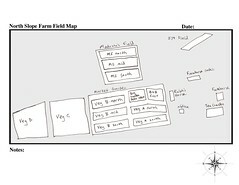 Alongside working on the crop plan for NSF I also created a plan for my own agricultural enterprise Blackbird Meadows. This season had its challenges with unfavorable weather. The spring was very wet which led to a delay in being able to plow the ground. During the middle of the season we experienced very little rain with high temperatures. The end of the season went out with a bang as hurricane Irene and tropical storm Lee left most of the Northeast flooded. Some of our crops got damaged and it ended the high yields on our tomatoes. The rain did not stop through September which left our fields fully saturated and we ended up with the same challenges as the beginning of the season. The crop plan was written during the winter without the knowledge of what the weather would be like. Dates for seeding in the greenhouse and out in the field would be our guideline to stay on track to supply for three farmers markets. North Slope Farm has big garden beds, field beds, two hoop houses, and a heated greenhouse. The BigGarden Beds are 4 foot wide by 100 foot long. They are raised beds that get prepared with heavy compost application, broad forked by hand, and then roto tilled with a walk behind tractor. We build the soil with these techniques and they have proved useful by having good drainage and high germination rates. We generally plant lettuce, arugula, spinach, tat soi, and carrots in these beds. Sometimes quick crops such as radishes and turnips are also planted. We seed across the bed for easier hoeing and a higher intensity of crops. Our field beds are about 220 feet long and about 16 rows across. This equates to fields that are divided up into plots under a half acre. Each succession we plant takes up one of those plots. This allows for proper management for crop rotations. The hoop houses are used to extend the season. This year we planted grafted tomatoes in one hoop house and used the other hoop house to start the season with vegetables planted in the winter and to grow yardlong beans during the summer. Our heated greenhouse is for our seedlings for sale and to transplant out in the field. We plant by phases of the moon. There is a lot of mysticism that surrounds this method but to me it has a very sobering effect on how to plan for the year. During the new moon we plant direct seeded crops in the greenhouse for transplants or out in the field (green beans, radish, turnips, carrots, lettuce, etc.). During the full moon we transplant our seedlings out in the field. Since the moon has an effect on gravity it is believed that the new moon keeps water closer to the surface due to lack of gravitational pull (which helps germination of direct seeded crops) and draws water down to the roots of transplanted crops during the full moon. These theories are being practicesed more indepthly through Biodynamics. The plan for the field needed to be changed at the start of the season. The wet spring forced us to plant field crops into the big garden beds. We practiced intercropping kale with radishes and swiss chard with turnips. A month later we were able to get into the field to continue our original plan. Some seeding gaps in the plan reflect low yields and not enough vegetables for the market. We have determined that planting lettuce in our big garden beds will give us a constant supply of lettuce for the market, almost not having enough some weeks. There was a gap in planting lettuce by a month and a half. We felt the missed lettuce as did the customers at the market! Our 5th succession was also behind. We kept the 5th succession in the crop plan open to interpretation as the season went on. This proved ineffective because it produced another gap in seeding which left us short on supply around late august. The dates of seeded vegetables can be seen in the harvest summary. It is important to write out the full plan even if it changes to keep everyone on track. During July it is very busy. Tomatoes require a lot of attention and the farm is buzzing with activity. This is the time that following a plan drawn out during the slow winter months would provide beneficial guidance for the farm. The grafted tomatoes were successful. We had tomatoes early, they were efficient to harvest, and produced a good yield for such a small space. For more information check the hoop house tomato post on this website. Blackbird Meadows taught me a lot this year. I produced for one restaurant mostly by myself. I had about ¼ acre in production while the rest was in cover crop of clover, oats, and oilseed radish. I formed 25 beds on the half acre plot and planted vegetables in every other row. The other rows were planted in cover crop. This was an experiment that yielded mixed results. The downside was more management to the cover crops that did not produce income. The positive side resulted in weed suppression and hopefully better fertility and soil for next year. Working on the field after work at NSF and almost every weekend proved to me that agriculture is my passion. I was able to grow crops I was interested in (Chinese cabbage, baby carrots, head lettuce) and understand the weekly demands of a restaurant. This helped me fully realize the importance of a crop plan for projecting yields and keeping a steady supply of vegetables throughout the season. Blackbird Meadows ended early due to running out of space and challenging weather at the end of the season. I feel it was successful in truly understanding what it takes to run a small farm. I produced a website and documented everything I grew and harvested. This was a great addition to my resume and gave me the confidence to seek opportunities that will help me grow as a farmer. Winter production had its challenges and triumphs. We constructed low tunnels out of rebar and manually vented them if the outside temperature reached above 60 degrees or the inside tempeture rose above 80 degrees. Wind above 30mph tended to blow the plastic loose. 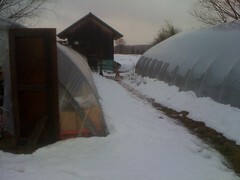 Our outdoor tunnels did great to extend the season into December, but were not active during the heart of the winter. We seeded spinach in November under the outdoor low tunnels and checked on them in spring to find a wonderful crop. The unheated greenhouse proved to be successful for multiple cuttings. This provided the bulk of our production. Stored carrots, turnips, and radishes also helped fill our market stand. Additionally, hourly wages had to be paid to the workers who took care of the crops, harvested and sold over the winter. WP Wages: We used profit made each week to pay workers. After costs incurred by North Slope were taken out of the gross profit of each market a proportional split, based on the number of hours worked, of the profit was used to pay workers. Each week varied depending on weather conditions, market success, crop availability, etc. However, it traditionally came to at least $8/hr. Overall, it was a pretty successful attempt to continue to grow and sell food in the winter while being able to provide some part-time work to farmers. The largest problem was weather, either while trying to harvest or trying to sell at market. If a snowstorm arrives the day of your market, there is likely to be little profit to pay an employee. 9/08/10- tatsoi, arugula, and spinach were direct seeded in the Big Garden Beds. They were covered with remay and eventually with plastic. This seeding date seemed to be early for winter production but was good for a strong finish to our regular markets. 10/06/10- lettuce, arugula, and tatsoi were direct seeded in the Farmhouse Gothic. The growth was great and proved to be a good date to seed for early winter sales. 11/03/10 – spinach was direct seeded in a Big Garden Bed that was out of production all year. We covered with a low tunnel and let stand all winter. In March, 2011 we began to harvest a good crop. January harvested 4lbs of salad mix and 1/4lbs of pea shoots. February harvested approx 4lbs of salad mix, 2 lbs of arugula and 2 lbs of tatsoi. March still harvesting but as of 3/10/11 harvested 11lbs of salad mix. From the Field: Spinach as of 3/10/11 23.5 lbs had been harvested for market and approx 5lbs for farmer consumption. Arugula in the field, the 40ft swath that developed and was sold in December was approx 19lbs. Kale and Swiss Chard had some small yields in the field but was minimal, more useful just as a display and for the die-hard chard and kale lovers. The tatsoi seeded ended up being used mostly for the end of season production. From the unheated gothic: Though we began using the gothic before our season was over we harvested from11/24/10-2/8/11 approx 133 lbs of salad mix (romaines, oakleaves and tatsoi). Approx 15lbs of arugula from a half a bed seeded. Summary: All in all, winter production is a difficult project. There is a lot of chance variability; cold snaps can come early and destroy your crop or blizzards can arrive on your market day each week for a month. Additionally, working out in the cold can be quite miserable when it is gray, wet, cold and windy. Washing products is also a major challenge, freezing pipes, hose line not to mention freezing veggies means there is little opportunity to wash crops. Therefore there is an added emphases on keeping crops clean in their beds and while being harvested. Then to top it off, the low temperatures combined with short day lengths means growth is nearly non-existent in the winter. It seems the best way to grow in the winter is to utilize low tunnels to extend seasons later and earlier (before it becomes too nasty, cold and snow covered out) and to depend on greenhouses for the actual winter-time production. One of the biggest things to look at is seeding and planting at the correct time and using cold-tolerant varieties. If plants have not had a chance to mature before it gets too cold and light levels shorten too much then it is not likely that those plants will grow until day lengths grow longer. It seems as though plants need to be mature by November if you plan on harvesting from them during the winter, if not you will probably have to wait until February before they will really start growing again. Also, we found some cold-tolerant varieties were heartier than others. Our red romaine did the best of the lettuces while our green oakleaf was useless in December. Each year one can narrow down varieties that stand the test of time and cold and continue to improve upon yields. Using a heated greenhouse to grow table top greens seems to be very challenging. The cost of propane to run all winter far exceeded the profit from what was grown. This is not the best way to use resources and energy. Next winter I would focus on planting cold hardy varieties under low tunnels and unheated greenhouses. General Observations: October started off with a cool 55 degree day. The crew was productive with their time which reflects in the myriad of tasks completed. Fires were lit in the bunkhouse to warm the hands of the harvesters. Kale, fennel, Swiss chard, and scallions filled the table at the markets. Many of the markets went well, with a few being slow due to weather. That always seems the case with farming in general. There were new trainee interviews and preparations to shut down the farm. Winter production was becoming a reality and talks of raised beds built with cinderblocks and lined with plastic became the objective. The outdoor washing area was built up with plastic walls to keep the wind down. Processing herbs for tea, from drying to bagging, became a focus for the crew. A touch of frost came in mid October. The beginning signs of winter were showing. The momentum of the season was still in full swing which was reflected in the hours worked. Administration 39 hrs: A Trainee Applicant visited the farm which began with an Intro to the website. The training program page was reviewed about wage rates and the value of the three year training program. Anticipated crops were discussed along with a walk through the greenhouses, market garden, office, cooler, and washing station. Bills were paid and a season summary was posted. Infrastructure 113 hrs: The amount of time spent on infrastructure is the same amount spent at the beginning of the season. A new battery was put in the Ford tractor, the walk behind mower got a belt adjustment, and a hitch was worked on for the movable chicken house. The ATV showed signs of old age because it started having trouble starting (wait until next years post to get the full story). A new trailer was ordered and delivered. Greenhouse 14 hrs: Weeding in the greenhouse took up the most time for the greenhouse tasks. This gave the plants the needed attention as winter approached. Planting 35.5 hrs: Oyster mushrooms were inoculated on the eastern side of Ralph’s House. Perennials were planted in the Tea Garden. Crop Care 44.5 hrs: The crew weeded the south edge beds of the farmhouse gothic and planted comfrey. They mulched with woodchips to be inoculated with mushrooms. Harvesting 213 hrs: Chard, kale, scallions, salad mix, and tat soi were growing well. Flowers were harvested for bunching and the first of winter squash made it out of the garden. Hay was cut and bailed for chicken bedding and general mulching. From Veg C and D, 142 bales of hay were collected. Nomad Pizza was getting their fare share of salad and the markets yielded positive results. Herbs were harvested for tea and there was some talk about selling Echinacea roots to an herbalist. Handling 94.5 hrs: SJ was trained the proper procedure on how to wash salad mix and all other vegetables. He washed every Friday for the entire month! BD also received training and helped out with washing scallions. Marketing 128hrs: Selling at farmers markets in NJ and to Nomad Pizza made for a good month in sales for North Slope Farm. Special Projects 56 hrs: Firewood was chopped to prepare for the winter. It is great to be able to use the farm’s woodlot for fuel. Mycelium Remediation “Mycoremediation” involved spreading sawdust and straw pellets on top of oily ground where the tractors are parked. Then it was watered. 2 gallons of oyster spawn was placed on sawdust and also covered with more sawdust. Moistened cardboard with more oyster spores were placed on top and then covered with mycelium slurry. More moist cardboard was placed on top. The hope for this project was to use mycelium to clean up the oil. General Observations: August is filled to the brim with energy. The daily chores and ebb and flow of harvesting, washing, marketing, and replanting hit its stride with the workers. This is time that people start to feel the totality of their work. Machines and tools break, the relentless rain never gives up, and people usually make a decision whither farming is meant for them or maybe they should try their hand at something else. I love August for this reason. It is the intensity of all the seasons work magnified by the sun. The days are long and the planning for fall crops are floating around. By the months end one feels a new beginning, but maybe that just has to do with the cycle of school starting up for the youth and people returning from their summer adventures. The crew at North Slope Farm dealt with a lot of rain in 2009. This lead to some delayed harvesting and radical growth of weeds made the third succession of vegetables a wash. Some markets were great; others were slow due to rain. The organic certification audit came and went with success. This is why it is important to keep records and have everything filed correctly. The workers play a major role in the administrative tasks. Each journal entry yields important information that the workers of next year will look to for guidance. It also fills in missing information that sometimes dose not get written down if a planting extends beyond the normal work day. It also accounts for the weather and pinpoints the struggles of growing vegetables for the market. Administration 26.5 hrs: The Organic Inspection was handled well with some notes to add the new salad spinner to our equipment list and to do annual soil testing to possibly not rotate tomatoes, or plant them in the same spot year after year. Some figures were tallied and $2550 a week should be made to hit the target gross yield. A seed order was placed for fall vegetables. A trip to Genesis Farms for a NOFA twilight meeting was made to learn about winter CSA planning. Infrastructure 83.5 hrs: Cleaning out the box truck from the weekend market became a weekly, but much need chore. Routinely mowing the edges of the field and diversions kept the farm in working order and clearly defined pathways for foot traffic and water runoff. The pool filter was changed and a new home was made for the chickens by attaching fencing to a greenhouse. Greenhouse 10 hrs: Seedlings were planted and watered. The limited hours reflects the small amount of activity in the greenhouse. Mold was found on the basil in Ralph’s House. Composting 4 hrs: One note was found about composting in the log: In vessel method for 3 days at 131*F with cover to ground is ok. Planting 17.5 hrs: The Big Garden Beds were prepped for 2 more successions of field lettuce and 2 beds of carrots. Crop Care 50 hrs: Weeding always plays a huge role in a vegetables success. With out using black plastic mulch to suppress weeds, time becomes a challenge. The third succession of vegetables was lost to over achieving weeds. Two rows of tomatoes were hand weeded and the rest of the beds were abandoned due to the amount of energy that had to go into it. Edges of beds were cut back by hand and everybody pitched in when time was available. Harvesting 250 hrs: By far the most time spent this month was harvesting. Weekly harvest for the market included field lettuce, green beans, Swiss chard, kale, cucumbers, Asian pears, scallions, tomatoes and flowers. Herbs such as spearmint and lemon balm were harvested and dried for herbal tea. Marketing: 140 hrs: Saturday market was at West Windsor, Sunday market at Summit, and Wednesday market at Hopewell. The most fruitful market was Summit, due to its location and reputation. The weather played a role in the success of people coming out and purchasing at the market. This is North Slope Farm’s main outlet for selling vegetables. MR was out for a week and people at the market were concerned for him. I filled in at the market this year at the same time and experienced the same concern among patrons. This proves that having a face for the farm means a lot to people, or that people just like MR.
General Observations: April is an exciting time of year. Spring is showing signs of potential growth and the weather is unpredictable, from cold snaps to heat waves. Seeding and following the crop plan worked out months before become the most important tasks. Cleaning up perennial beds and feeding compost to plants marks the beginning of the growing season. Tractors are waking up and getting ready to enter the fields as soon as the weather allows. It is a time of awakening, through work, the weather, and the soil. Administration 49 Hours: Setting up new employees in the system, payroll, and placing new seed orders started off April. “Surface Water Drainage System” is broken down to: responsibility – manage drainage with out erosion, production requirement – drain production area, related regiment – production areas need water during dry times, long term – catch drainage for later use. April is Surface Water Drainage month. Infrastructure 59 Hours: Repaired water lines and getting the greenhouses into shape reflect the farm starting to wake up from winter. A broken market tent was also fixed. Greenhouse 130 Hours: The temperature went from freezing to a heat wave! 4/2 – first succession of seedlings planted. A trip to Russell Garden yielded some herb plants and inspiration for greenhouse set up. Watering, planting, and temperature control through venting took time and consideration. Watering the greenhouse took 2 hours a day by the end of the month. Mice damage to seedlings persisted. Composting 93 Hours: Piles were built with added nitrogen in one pile and mycelium in another pile for future investigation. To break down leaves add 1.5# of nitrogen per 1 cubic yard of leaves. The manure spreader broke and composting was done with a trailer attached to an ATV and spread with shovels by hand. Planting 33 Hours: Fertilizer (Fertrell 5-1-1) was applied to beds that will have perennial flowers and apple trees. The first succession of vegetables were planted which included chard, kale, beets, scallions, and radishes. A lettuce variety trial was also planted with notes on which variety grew the best. Crop Care 74 Hours: Chisel plowing and rototilling prepared the fields for planting. Weeding and mulching perennials became a priority. By the end of the month the peas needed trellising. Harvesting 23 Hours: Scallions that were over wintered in farmhouse gothic were harvested before they went to flower. This is an interesting time to harvest because new seedlings are growing while the few plants that hung on throughout the winter are still able to make it to market. Marketing 51 Hours: Herbal tea was highlighted at the market with samples of brewed, hot, fresh, delicious tea. A new marketing layout was discussed, which is always important to have in dialogue with the manager and workers. Displays should be dynamic and kept to look fresh. Special Projects 9 Hours: MR gave a soil structure workshop for SAITA. At the workshop is where I first visited North Slope Farm, however I was working at another farm at the time. I appreciated the charm of North Slope and liked the way MR presented information. It is important to open up your farm and give back to the community of farmers. Intent: To extend the growing season of leafy greens, lettuce, and root crops to serve our existing outlets such as Hopewell Farmers Market, Nomad Pizza, and Zone 7. • Outdoor low tunnels will cover crops such as tatsoi, spinach, and arugula. Two cuttings are expected for harvest. The hoops are constructed of 3/8” X 12’ rebar covered in recycled drip tube. The outer skin is 6 mil plastic that is 13’ W X 50’ W. A layer of remay may be added to the interior for extra warmth and reduced temperature fluctuation. • One hoop house will be used for direct seeded crops such as spinach, arugula, tatsoi, and salad mix. The other hoop house will be used for transplanted crops such as kale, scallions, leeks, swiss chard, fennel, and beets. Carrots and radishes have been direct seeded into one open bed early, as the other beds are currently occupied by late planted tomatoes. • .The heated greenhouse will be used for table top production of salad mix. Potted herbs such as parsley and basil will also be grown. • Regular records will be kept of costs and production. Worker hours and market income will be tracked. The materials purchased should be able to be reused, improving profit margins in future seasons. 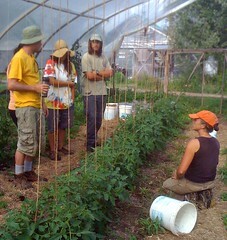 • Workers will have to be mindful of temperature to open and close the low tunnels or remove remey in the hoop houses. The difficulty of winter weather will be a challenge in harvesting, handling, and marketing. Costs will be calculated against profit to see if this is a viable operation for North Slope Farm. • The inspiration for winter production at North Slope Farm came from a lecture at the NOFA summer conference. A Connecticut grower, in zone 3, presented a low tech option of covering field crops to produce a nutritious and profitable product for his customers during the winter time. This inspired me to keep producing local organic food through the winter. I hope that having a consistent presence through the winter will support existing customers and win over new customers. Winter production also keeps workers on the farm and in constant dialogue with agriculture. Some challenges we have already faced have been 30mph winds blowing off our outdoor low tunnels. Did we cut the plastic too short? Are the sandbags not filled enough? Do the tunnels need to be smaller? At what temperature should we open and close the tunnels? These are questions that have already risen and in the middle of the winter I am sure there will be many more. To supply fresh local organic food is the main goal and we will need support from our community to make it a reality. My focus this year was equipment. The first task I had was to make a list and identify every piece of equipment on the farm. My list will need to be modified and added to because as the season rolled on more equipment emerged out of overgrown grass and other equipment never worked in the first place. Troubleshooting was eminent from all of the challenges we had with equipment failure this year. In the beginning of the season our main work horse, the ATV, would no longer start. After checking loose cables, gas lines, and the spark plug we realized that there was a more serious problem going on. I checked the internet with the ATV’s make, year, and model and all signs pointed to a problem with the electronic motor start system. This was further backed up when a proper electrical test determined it needed a new starter system. The ATV spent over a month and half in the shop and we were left to improvise with the equipment we had working to spread compost, assist in planting, and move vegetables and materials around the farm. We were very happy when the ATV came back from the shop. I started the season with retrofitting a trailer top to a new chassis. This was a great exercise in simple metal work and structural design. Out of tube stock and bolts I was able to customize an attachment point that has held strong all season with a lot of use. General maintenance started with locating and greasing zerks (nozzles that the grease gun attaches to) on all of the machines so they were ready for the field. A procedure was placed when operating all machinery that entailed checking the fuel, coolant, and oil levels. Even though we tried to do this before each use, the hectic frenzy of trying to get things done when time allows led to some mistakes. We ran out of gas in the field and towed the tractor in with MR’s Volvo to only realize the tractor needed gas. Gasoline was put in the Kubota mower instead of diesel, something that was done several times in the past years as well. For the most part machines were fixed and we made do with what was available. 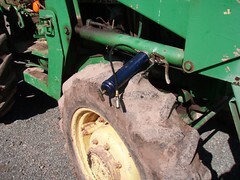 John Deer 2240: Hydraulic hose leaked and it seems to be because of the new fitting attachment. We put Teflon tape and liquid rubber that created a gasket to solve the problem. Maschio Rototiller: Gear box set to medium low. This caused the Ford 4600 to overheat after two passes of rototilling. We set the gearbox to low and the overheating has stopped. Bachtold Mower: Blade would not engage when the lever was pressed. Everything seemed to work mechanically. The nut at the bottom of the mower was tightened and allowed the blade to be engaged. The reality of farming is that not everything works when you need it to. Also, farming is dependent on weather and field conditions so failed equipment can be very disruptive. This season I had the opportunity to use all of the field implements to turn new ground, which require minimal maintenance and a working tractor. I also was able to trouble shoot small engine machines, which are critical in bed preparation and field care. I have learned that we need to have a station that is organized and in a central location to fix our small machines and tractors. We need to label our fuel clearly as well. Our hand tools we use in the field can also be reorganized for better care and clarity for potential newcomers. As the season slows down I am looking forward to placing some procedures in place dealing with equipment and finally doing the much needed oil change on all of the tractors. The NOFAsummer conference in Amherst, MA was inspiring. We started the journey with a three hour field salad harvest at 6am with our friend Ryan, who used to work at Cherry Grove Organic Farm. After the harvest we began the drive up to the summer conference. We arrived just in time to make a two mile bike ride to U Mass and hear Bill MacKently, from St. Lawerence Nurseries, talk about alternative energy on the farm. He was enthusiastically spreading do-it-yourself construction of renewable energy sources. Saturday morning started off with Robert Fuqua describing how a 4 cycle engine works, repair techniques, and where to get parts. Next stop was Agroforestry in the Northeast taught by Conor Steadman and Mia Frank. This was a great introduction to permaculture. Small fruit on a organic farm, by Julie Rawson and Jack Kittredge, went into production techniques for blueberries, blackberries, gooseberries, grapes, currants, and elderberries. After the workshop we got an amazing tour of Hampshire College CSA. They didn’t have a weed in sight! Saturday night consisted of finding a guitar case for Sam in a dumpster, riding a moped around a corn field, and meeting more friendly people that are into sustainable ways to approach life. Sunday morning started off with Potato Culture, by Bryan O’Hara of Farms at Tobacco Road Farm in Lebanon, CT. This peaked my intrest in potato growing. I stayed for his next lecture on winter production techniques. He explained cost effective ways of extending your season in the field, and how to direct seed crops in December for an early harvest in spring. After the conference we drove to Battleboro, Vermont. We stayed at Harvest Hill Farm where we fed their four pigs and took a walk through their vegetable and herb garden. It was an a amazing time. Sam and I left Ryan at his home, a converted chicken shack, and headed back to NJ with a culture for Kumbucha while listening to Tilth.